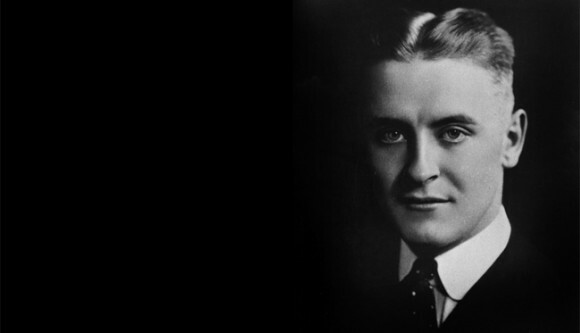 Between the years 1919-1924, Fitzgerald fame starts to skyrocket. On September 16th, 1919, Maxwell Perkins of Scribner's accepts This Side of Paradise. Later on March 26th, 1920, the novel is finally published. In November 1919, Fitzgerald and Zelda are officially engaged after he visits her in Montgomery, Alabama. Below there are excerpts from letter's he wrote during the years 1919 and 1924 the show the depression that came over him while he was living in New York City. During this time Fitzgerald saw his way in and out of the city countless times to resume writing somewhere else in America. The city was utter chaos to him, and as the fame took over his life, so did the city life. He was not ready for the amount of fame that came his way, and being in the #1 city in the world to start a career, he was drowning in what the fame brought him. It was obvious to the literary world that Fitzgerald was a depressed alcoholic, but his true character shows through his letters. Before we meet again, I hope you will have tasted strong liquor to excess and kissed many emotional young men in red and yellow moonlights-- these things being chasteners of those prejudices which are as gutta percha to the niblicks of the century. I am frightfully unhappy, look like the devil, will be famous within 1 12 months and, I hope, dead within 2. Excuse the pencil but I'm feeling rather tired and discouraged with life tonight and I haven't the energy to use ink-- ink the ineffable destroyer of thought, that fades an emotion into that slatternly thing, a written down mental excretion. What ill-spelled rot! Hope you're enjoying New Hampshire-- you probably are. I'm having a hell of a time because I've loafed for 5 months + I want to get to work. Loafing puts me in this particularly obnoxious and abominable gloom. My 3d novel, if I ever write another, will I am sure be black as death with gloom. I should like to sit down with ½ dozen companions and drink myself to death but I am sick alike of life, liquor, and literature. If it wasn’t for Zelda I think I’d disappear out of sight for three years. Ship as a sailor or something + get hard -- I'm sick of the flabby semi-intellectual softness in which I flounder with my generation. Now as to the liquor thing-- its true, but nevertheless I'm going to ask you to take it out. It leaves loophole through which I can be attacked and discredited by every moralist who reads the article. Wasn't it Bernard Shaw who said that you've ether got to be conventional in your work or in your private life or get in trouble? Anyway the legend about the liquoring is terribly wide-spread and this thing would hurt me more than you could imagine- both in my contact with the people with who I'm thrown- relatives + respectable friends- and, what is much more important, financially. ^ This letter was written in regard to what Edmund Wilson (Bunny) wrote in an article about Fitzgerald. Fitzgerald's alcoholism was widely known and that fact that Bunny put that in his article, that is something that Fitzgerald does not want to be continuously known about him. He later asks Bunny to replace "when sober" with "when not unduly celebrating" to show that he was not always drunk all the time, because that would ruin his career. 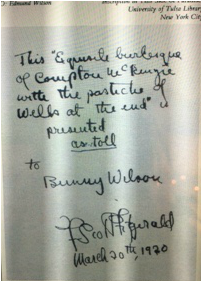 but here is the handwriting of Fitzgerald.